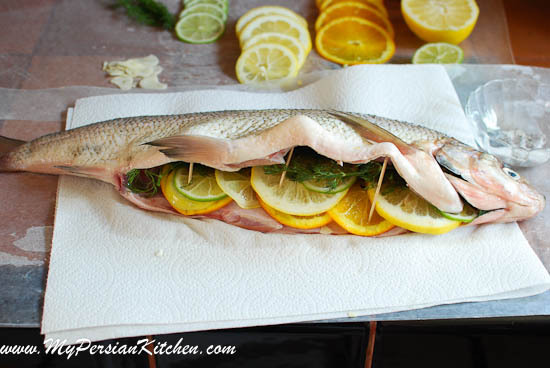 Last year I posted a super easy, yet delicious, recipe for Pan Fried White Fish which can be made for Norouz. This year I am featuring my staple recipe that I pretty much make every year for our Norouz Party. In a perfect worldI would make pan fried fish to accompany our Sabzi Polow, Rice with Fresh Herbs. The issue is that I generally cook for 20+ people and just the thought of frying fish for that many people gives me heart palpitations. Not only would I smell totally fishy, and be totally offensive to my guests, but the lingering smell of fish inside our house would simply drive me completely mad. So I simply take the easy way out and cook a few whole fish in the oven. Not only the preparation for this recipe is super easy, but it’s always pretty fast. 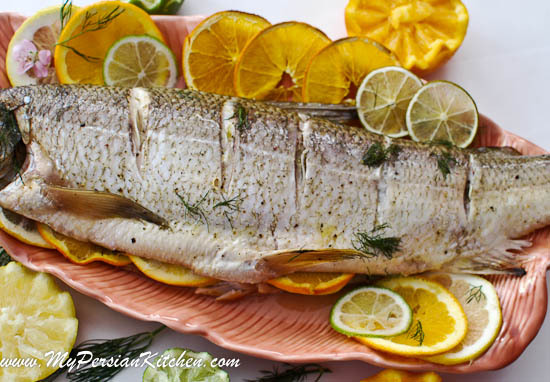 White Fish has a very mild taste and I have found that the simple combination of various types of citrus, garlic, and dill is incredibly delicious. First things first: thin slice orange, lemon, lime, and garlic cloves. I like to use a Mandoline for this as it makes everything so much easier. Wash dill and remove the hard portion of their stem. I personally like to buy a whole fish and leave the head on. 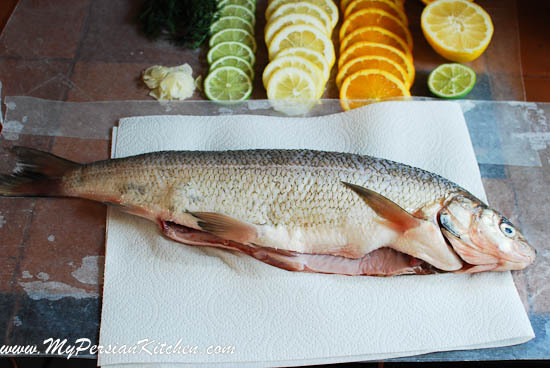 At this point you can either continue cooking the fish with its head on, or simply cut it off. Wash fish and pat completely dry. Season inside the cavity of the fish with salt and pepper. Then arrange a few slices of garlic cloves, top with a few slices of oranges, lemons, and lime. Add a few more garlic cloves on top, followed by some dill. Next score fish every two to three inches for even cooking. Then add a touch of olive oil and season with salt and pepper. If you appreciate garlic as much as I do, then add a slice where you scored the fish. 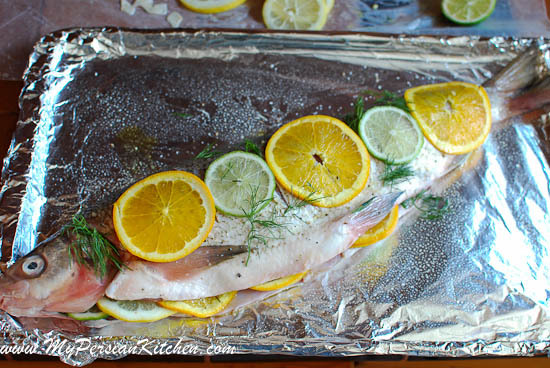 Spray a cookie sheet (lined with foil) or roasting pan with some olive oil; then flip fish onto the pan seasoned side down. Score fish every two to three inches. Rub some olive oil on, or butter, all over the fish including the head and tale, season with salt and pepper. Add a garlic slice in each hole from scoring. Add a touch of juice from either one of the citruses. 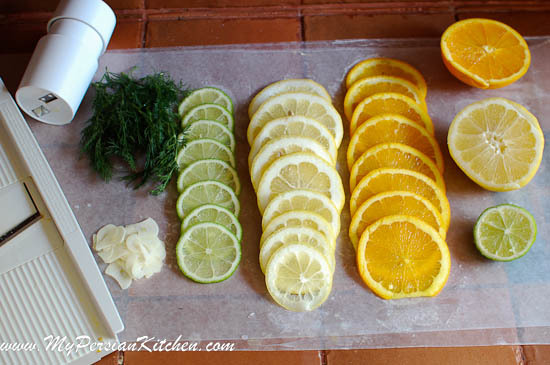 Arrange remaining slices of orange, lemon or lime on top along with remaining dill. 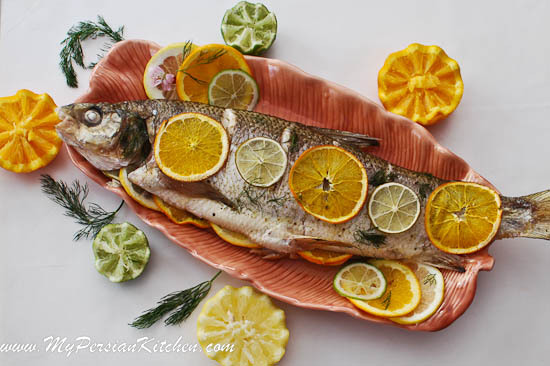 Cook in the oven at 375° until fish is completely cooked. 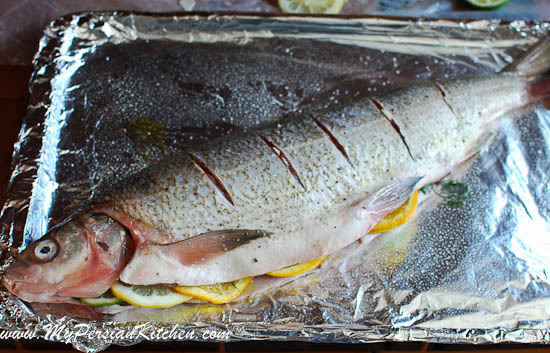 Cooking times generally vary depending on the thickness of the fish. Generally, cooking time is 10 minutes for every inch in the thickest part. My fish was about 3 pounds and it was cooked to perfection in 30 minutes. 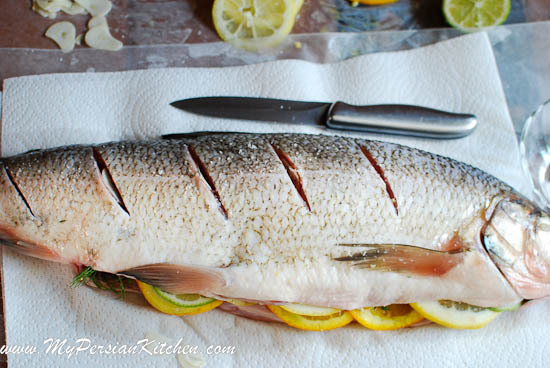 Serve fish immediately along with slices of lemon and lime. Also, it’s up to you if you’d like to serve your fish with its head on or off. I always like to leave mine on for the fish to make a statement!!! Some people like it and some don’t! Most important: make sure you warn your guests about the fish bones! Nice recipe, and it sure is impressive! I was wondering if it was possible to do the same with salmon! Yasemin, you can make this combination of flavors with any type of fish. Raphael, I purchased the fish from my local Persian Market. Here is LA they simply call it White Fish.